100% natural, non-altered ingredients from sustainable resources. Environmentally Friendly: Biodegradable, non-ozone depleting, contains linseed and tung oil, pine rosin, beeswax and citrus oil. No chemicals, dryers, or petroleum based products. Hardens, and then cures, much like old-time, varnish-like, furniture finish. Reduces checking. 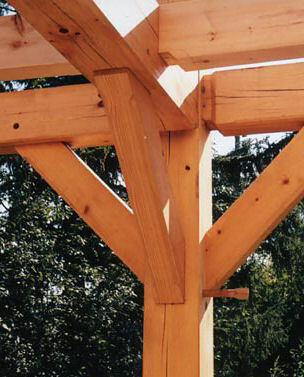 Experience shows that timbers that have begun dramatic twisting often stop checking further, even in green oak. 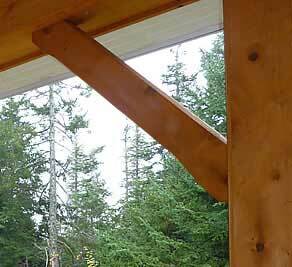 On timber frames and logs, Land Ark is ideally applied right after joinery is completed, before assembly of structure. 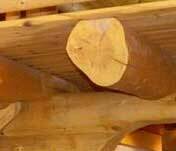 While waiting, it will reduce checking; during erection logs will soil little; after assembly clean up is easily done with Land Ark and scouring pad. And if structure is exposed to weather, it is protected. Colors if needed, for the time being, to be mixed by yourself. Contains no petroleum products, chemical additives, or metallic drying agents. Tung oil: 100% pure with no additives; highest quality; dries harder and more durable than linseed (a.k.a. flaxseed) oil alone. Both of the oils are dryer-free and slightly heat-treated (polymerized). Flaxseed oil: Purified and refined by natural oxidation; dries as clear or clearer than tung oil, with none of the characteristic discoloration that is typical of hardware store varieties. No other finishing oil penetrates as deeply into wood. Beeswax: Filtered, chemical and bleach-free capping wax is used. Beeswax adds visual depth of grain, smoothness, and elastic durability to the finish; it also forms a skim coat that keeps the finish on the wood, slowing the evaporation of the solvent, and thus giving the oil more time for absorption. d-Limonene: Food grade. This is the purest form of citrus turpenes (citrus extract), and it is extracted only from the cold-pressed oil of the orange peel. It is the only solvent used in Land Ark finishes. Natural rosin: Gum rosin extracted from the sap of the pine tree and separated from the turpentine. This is the gum rosin found in heart pine, giving the wood its hardness and durability. No synthetic rosins are used. Cypress oil is no longer available. We are now using a fungicide and UVA that both have safe environmental profiles. MSDS reports available on request. We regret that for some time we were unable to secure adequate quantities of this wood finish, due to circumstances beyond our control. Now, the original Land Ark is back, with a new production facility to serve both the USA and Canada. Suitable with any applicator and application technique: thin-and-dry coating, surface flooding and buff dry, wet sanding, French polishing, mechanical buffing. Avoid application in direct sunlight if at all possible. See more details and application instructions under each particular product. Got questions about which additives to use? Interested in adding color to your wood finish? Call us for a free consultation about YOUR project at 1-800-350-8176.